Our team here at Picniic wants to help you organize your days and also help you to fuel your busy life. We value healthy eating as part of an efficient and healthy lifestyle. Here are some healthy meal ideas brimming with nutritional quality to add to your recipe rotation. 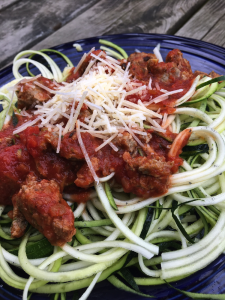 Today’s meal ideas are brought to you from a friend of ours, Jeanne Parks, who is devoted to good nutrition and family-friendly foods. 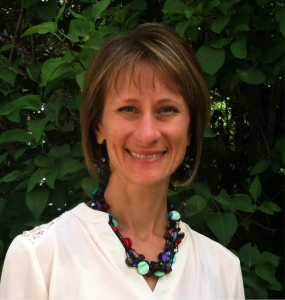 Jeanne is a Nutritional Therapy Practitioner, Personal Private Chef, Entrepreneur, and Mom. Her love for whole, unprocessed food has inspired her to prepare nutritious and delicious meals and engage in a healthy lifestyle that inspires adults and children to develop healthy habits and kitchen skills. Jeanne has certifications from accredited programs in holistic health and has perfected her cooking skills to overcome both personal and family health issues. That passion and desire to help support families who want to move beyond surviving to thriving with optimal health is at the core of her business model. Visit her blog, Purposeful Eats, for information about her health coaching services, more mouth-watering recipes and healthful eating tips. Each recipe post has a What You Eat Matters section that is chock full of nutritional information about each of the ingredients in the dish. Learn more about what you are serving your family! Here are 5 fantastic recipes from Jeanne’s kitchen. Breakfast foods are the easiest to teach to young or novice cooks. Crepes are easy to make and a fun French version of a kid-loved breakfast food, pancakes. The blueberry sauce kicks the dish up a notch with powerful antioxidants. The whipped cream, well…it turns breakfast into a celebration. 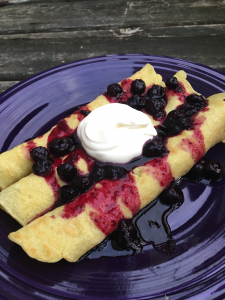 Make these yummy breakfast crepes this week with your kids! If your coconut oil is solid, melt it first in a small saucepan, but then allow it to cool. Crack the eggs into a medium-sized bowl and whisk in the melted coconut oil and water. Add the dry ingredients and beat well to combine. In small or medium-sized, non-stick skillet over medium heat, pour in some of the batter – you need to make them quite thin – and immediately roll it around to evenly coat the bottom. The crepe should start to pull away from the edges as it cooks. Cook for one minute on each side. Remove from pan and repeat until all the batter is used. If saving for later, cool completely and store in an airtight container. In a saucepan over medium heat, add the first three ingredients: blueberries, lemon juice, and honey. Mix together and let simmer. Once blueberries have broken down, bring heat to low to let thicken slightly. Add the whipping cream and powdered sugar into a large mixing bowl. Using an electric mixer, beat on high speed for 3-5 minutes or until the cream forms stiff peaks. Refrigerate until ready to use. Is your kitchen overflowing with zucchini? This time of year brings on an abundance of zucchini and the last of the summer corn. Use up those amazingly healthful vegetables with this scrumptious soup! It adds a new flavor dimension for these veggies still in bounty and awakens memories of the crisp, fall days ahead. Summer Garden Chowder has a satisfying crunch from the sautéed zucchini, onions and corn. The herbs elevate the flavor of these sautéed veggies and provide additional health benefits. The coconut milk offers a creamy, delightful texture. You can pair this meal with a fresh green salad or a loaf of fresh baked bread. In a Dutch oven, sauté the zucchini, onion, parsley, basil, salt and pepper in butter until vegetables are tender. Stir in the flour, trying to cover all the veggies. Gradually stir in the chicken broth. Add the lemon juice. Bring to a boil; cook and stir for 2 minutes or until thickened. Add the tomatoes, corn and coconut milk; bring to a boil. Reduce heat; cover and simmer for 5 minutes or until corn is tender. Just before serving, add in parmesan cheese and sugar; stir until melted. Garnish with parsley if desired. Spiralize zucchini squash onto dinner plates. Make or heat up your favorite healthy sauce (or grated cheese for kids) and pour over noodles. 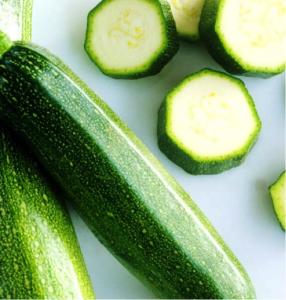 For more nutritional information about zucchini, visit Jeanne’s blog, Purposeful Eats. A few prep notes: roasting the sweet potatoes takes about 20 minutes, then you need to allow for a bit of cool-down time. If you can make the salad several hours ahead of time, you’ll appreciate the flavors that develop as it marinates. This dish can be served as a meal in itself or as a side salad to your favorite protein. – Instructions for preparation found on Jeanne’s Purposeful Eats blog. 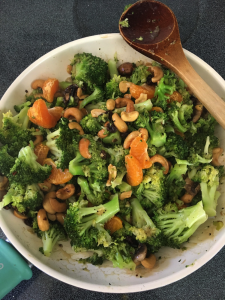 Jeanne says, “Asian cuisine ranks near the top of my favorite dishes, however I made a conscious decision years ago to eliminate soy and soy products out of my diet. Soy is a common food allergen and soy sauce usually contains gluten, is very high in sodium, may contain colors, additives and MSG. After considerable research, I’ve chosen to eliminate soy from my diet. That doesn’t change the fact that I love Asian cuisine. I have yet to find a local restaurant who doesn’t use soy sauce. Hopefully one day that will change. Until then I have found a perfect alternative for the recipes I make in my own kitchen – Coconut Aminos. It’s soy-free, gluten-free, low sodium and has the closest flavor to soy sauce one could find. 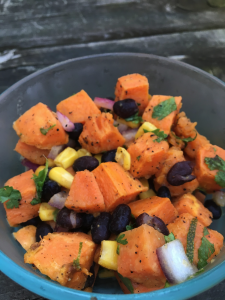 For instructions on making this dish and more nutritional information about coconut aminos, visit Jeanne’s blog, Purposeful Eats. Happy, healthy eating to you all!